Profile: Brainstorm is so full of ideas that often he's disclosing the next one before he's finished explaining the first. His mind seems to work at a fevered pace. Even when he's not consciously applying himself to thinking creatively, a part of his subconscious circuitry proceeds on its own - he often interrupts conversations, battles, even himself with typically irrelevant, but brilliant, pronouncements. On Cybertron, he felt unappreciated, since warriors were valued far more than robot geniuses. He's found Nebulos to be more fertile ground in which to plant his ideas. His most significant contribution so far has been devising a way to install the humanoid Nebulans into headless Autobots to create the Headmasters. Arcana's genius is a bit more mysterious. Trained as a medical doctor, the Nebulan quickly rose to the top of his field, but he found his job unchallenging, so he turned his attentions to studying the ancient lore of Nebulos. He became learned in many sciences that had long been repudiated, which earned him the disfavor of many of his medical colleagues. Arcana combined some of that ancient knowledge with his modern medical skills to bio-engineer Nebulans, including himself, so they could transform and become the heads of the Autobot Headmasters. Working with Brainstorm, Arcana made Fortress Maximus's vision of the Headmasters a reality. He is the oldest Nebulan among the Autobot Headmasters, and the wisest. He is also the most remote - no one truly can fathom the workings of Arcana's mind, not even Brainstorm, who shares it. 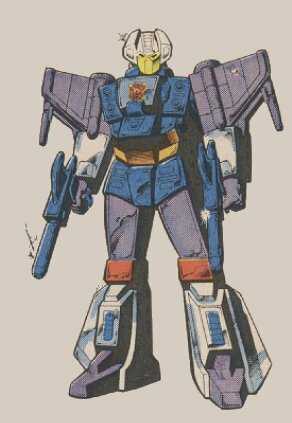 Abilities: In jet mode, Brainstorm has two solid-fuel after-burning turbofan jet engines that propel him to a maximum speed of 5200 mph. He carries two high-energy photon pulse cannons on either side of his nose module, which he can also use in robot mode. His range is 8000 miles. Weaknesses: Brainstorm's mind sometimes works so fast that he overheats and shorts out sections of his cerebro-circuitry, which often leaves him disabled. In jet mode, his engines are also prone to overheating. If driven too hard, they burst into flame. If Brainstorm is lucky, he can manage to glide back to the ground without crashing.